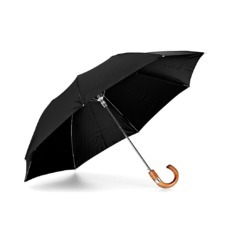 Face the elements with our Luxury Men's Umbrellas. Handmade from lightweight yet thoroughly durable materials, our automatic spring loaded umbrellas are ready to tackle inclement weather at a moment's notice. A traditional maple wood handle lends a sense of timeless sophistication to the sturdy structure of each umbrella, whether our classic stand up or modern compact style. Discover a trio of traditional shades to extend your sense of style whatever the weather; a must for every gentleman. 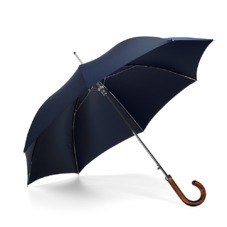 Our Luxury Men's Umbrellas are handmade in Italy by master craftsmen with first-hand experience of the great British weather. Whether you're teaming it with brogues or wellingtons, our luxurious range of men's umbrellas are ready for duty at any moment, expanding at a touch of a button with the automatic spring loaded opening mechanism. 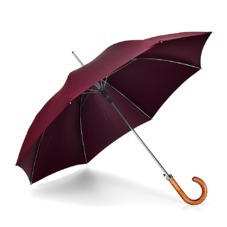 Available in compact or long walking styles in a choice of navy blue, burgundy red or traditional black, our range of luxury men's umbrellas will prove indispensible in both a light shower and a fierce storm!